Surviver for WMP version 8 or higher, you need Alpha transparency support to use this skin. Playlist, EQ, Visual Effect and Video settings. Video window will be in next version coming soon. Okay well nice looking, nice animation and overall well-done. But... your text for video settings is hard to read and illegible and why are you releasing an unfinished skin? YOU have video settings without a video window. Seems you should finish the skin before releasing. Otherwise its a nice skin. I really like the texture too. Wow! The colors, animations, and texture! An Industrial SciFi look! And dark tones! Please Give me More!!! Nice !!! Can we expect a compliment WB-skin ? @Skins Factory : I really don't like Your attitude (As already noticed elsewhere sooner then now).It's not that YOU are the god of WMP skinning or something, You know ? C242: i have an attitude because i would like to see a finished skin uploaded instead of an incomplete one? LOL ok. Funny i thought i complimented her work except for that point. What if Alexandrie couldn't wait any longer to release the skin ? So we have a sort of preview ? It was said the video part is missing, so what ? AMAZING !! 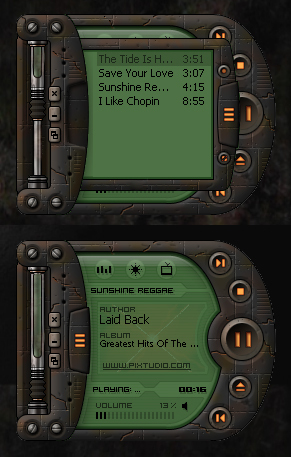 This is one of the best skins featured on this site.. no doubt about that. Just download the font and you're on your way !